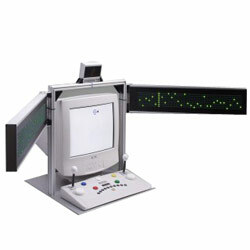 Objective and precise measurement of the visual field of perception. This test was designed to assess the perception and processing of peripheral visual information. Main areas of application: traffic psychology, pharmacology, aviation psychology, sports psychology, industrial, and organizational psychology. Speed estimation (high angular velocity in the peripheral visual field). Steering a car (through objects that pass by at the sides of the road). Observance of the surroundings (by detecting incidents and objects, e.g. cars turning in from another road, or passing). The PP made possible to design a purely behavior-related instrument that meets high methodical demands. Light stimuli - produced with the light emitting diodes mounted onto the device - move along with a pre-set speed (in regular "jumps"). Critical stimuli appear in pre-set time intervals, to which the respondent has to react by pressing the foot pedal. Studies to prove the reliability of this test have not yet been conducted. Context-logical validity or a high self-evident validity can be assumed. Critical stimuli are presented in the visual field of the respondent to which he / she has to react as quickly as possible just like for instance in road traffic. Norms of N=360 adults are available for the variables Field of vision and Tracking deviation. The time required for the text is approximately 15 minutes (including the instruction and practice phase).